A kind of research that does not race towards its goal – the theory of science is too narrow, but artistic freedom allows leaps, behind the reality of phenomena. 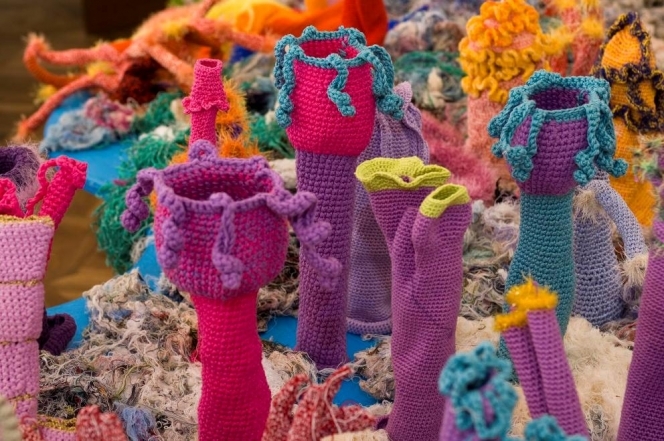 Petra Maitz reflects communities of nature and human beings as an image of origination as a result of the action of many, places adverts encouraging women and men to crochet corals in a free interpretation. With the aid of this method she turns the project into an art project, organises collective work, appropriating the method of the coral reef itself in order to portray it.